Karnataka Marketing Federation Recruitment 2018: Karnataka State Cooperative Marketing Federation is announced a new notification through online for the available vacancies of Senior Assistant, Junior Assistant, Assistant Engineer, Branch Manager, Internal Auditor, Senior Computer Analyst, Senior Accounts Assistant, Stenographer, Junior Accounts Assistant and Class IV jobs. 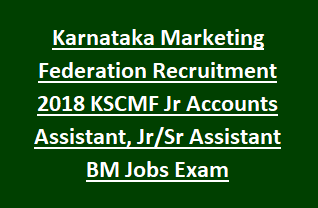 There are total 163 vacancies in this KSCMF Karnataka Marketing Federation recruitment 2018. KSCMF application form will accepted through official website of http://recruit-app.com/kscmfl_2018/. Online applications for this Karnataka Marketing Federation Recruitment 2018 is available from 09-01-2018 to 02-02-2018. Candidate selection for this KSCMF Recruitment of Junior Assistant, Senior Assistant, Junior Accounts Assistant and other posts will be through online written exam. For Class VI jobs only interview conducted, no written exam. More information related to this KSCMF Recruitment Exam Pattern and Syllabus, available Vacancies, online application procedure and other details are given below. There are total 163 Posts in this Karnataka Marketing Federation Recruitment 2018. 120 Posts are reserved for Non Hyd Kar candidates. And 43 posts are reserved for Hyd Kar candidates. For Ex Serviceman and PH candidates up to 10 years of age relaxation will be given while comparing with normal candidates. (i) Should possess any degree from an University established by Law in India, (ii)knowledge of computer operations and Applications; and(iii)Knowledge of Kannada with ability to read, write, understand and speak Kannada fluently. (Preference will be given to persons with 3 years experience in the field of Agricultural Marketing and agri. Inputs sales and having experience in Tally Accounting). i) Should possess any degree from an University established by Law in India, (ii)knowledge of computer operations and Applications; and(iii)Knowledge of Kannada with ability to read, write, understand and speak Kannada fluently. (Preference will be given to persons with 2 years experience in the field of Agricultural Marketing and agri. Inputs sales and having experience in Tally Accounting)..
(i) Should possess any degree from an University established by Law in India, (ii)knowledge of computer operations and Applications; and(iii)Knowledge of Kannada with ability to read, write, understand and speak Kannada fluently. (Preference will be given to persons with 1 years experience in the field of Agricultural Marketing and agri. Inputs sales and having experience in Tally Accounting). (i)Should possess a degree in Commerce from an University established by Law in India, (ii)knowledge of computer operations and Applications; and(iii)Knowledge of Kannada with ability to read, write, understand and speak Kannada fluently. i)Should possess any degree from an University established by Law in India, (ii)Knowledge of computer operations and Applications; and(iii)Knowledge of Kannada with ability to read, write, understand and speak Kannada fluently. (i)A Degree in Commerce/Cooperation/ Management from any University established by Law in India;(ii)A pass in Certificate Course in Tally with knowledge of Computer Operations and Applications; and (iii)Knowledge of Kannada with ability to read, write, understand and speak Kannada fluently. (i)A pass in II PUC or a pass in three years Diploma in Commercial Practice;(ii)A pass in Senior Kannada/English Short- hand having knowledge of Computer operations and Applications; (iii)A pass in Senior Kannada/English Typewriting; and(iv)Knowledge of Kannada with ability to read, write, understand and speak Kannada fluently. (i)BCA Degree from an University established by Law in India;(ii) Knowledge of computer operations and Application, with 2 years experience in the field. (iii)Knowledge of Kannada with ability to read, write, understand and speak Kannada fluently. (i)A Degree in Commerce or Cooperation or Management from any University established by Law in India;(ii)A pass in Certificate Course in Tally with knowledge of Computer Operations and Applications; and (iii)Knowledge of Kannada with ability to read, write, understand and speak Kannada fluently. A Pass in S.S.L.C. with Kannada as one of the Languages. Candidates selection will be held through online written exam and interview. For Group 4 jobs only interview will be conducted. There is no exam for Group 4 jobs. For Group 4 jobs based on SSLC marks a merit list will be prepared and for them only interview will be conducted. For all the posts written exam will be conducted online. For all the posts two papers will be given for examination. Paper 1 is common for all the candidates. Paper 2 will be conducted depends upon the post nature. It means paper 2 will different for each post. Written exam will consist of two different papers. Paper 2 Exam Pattern is may while comparing with Paper 1. For computer analyst, accounts assistant and stenographer jobs exam pattern for paper 2 will be different. Interested candidates may submit their application form online on or before 02-02-2018 through official recruitment website of http://recruit-app.com/kscmfl_2018/. Candidates must have provide required information at the time of online application form and also read the notification before applying online.